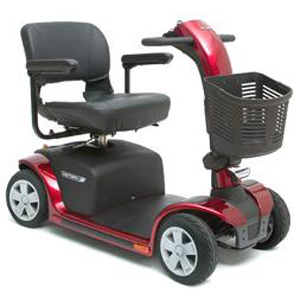 The Pride 2010 Victory 9 Mobility Scooter is an extremely portable, lightweight scooter that represents a new generation of indoor/outdoor mobility vehicles for Pride. It is a compact scooter designed for ease of use and contains innovations such as self-contained removable battery/charger pack and infinitely adjustable folding tiller. The Pride 2010 Victory 9 Mobility Scooter requires little or no disassembly for transport.